I Should Like to Say Two Things – Patrick F. Clarkin, Ph.D.
Nobody has a monopoly on the truth, and a good deal of psychological research has pointed out that our brains are set up with a lot of blind spots and self-serving biases. Despite this, hopefully we can agree that there is an objectivity ‘out there’ that we can all gain access to, at least in theory, and that a heightened consciousness can make us aware of our biases (that might be wishful thinking). Therefore, Russell’s two points are interconnected: we risk further disagreement and hostility if we cannot even agree on what the facts are. I think this is what gives science a special place in the realm of knowledge because it revolves around accumulating evidence and discarding disproved ideas, rather than relying solely on the foregone conclusions of dogma and ideology. Scientists, being human, are not immune to bias, but ultimately the goal of science is a noble one: to seek an understanding of nature by piecing together facts in order to formulate theories. When theories are not supported by the facts, they should be discarded. Other systems of knowledge have a harder time with facts that do not fit their theories, giving them a higher propensity to simply throw away the facts. Many have pointed out that some of the most impactful scientific discoveries in history have been humbling to the Western view of humanity’s place in nature, and that this is one reason there has been resistance to them. This will be a somewhat caricatured synopsis, but we’ve gone from seeing the universe as designed, ordered, constant, and anthropocentric to one that is mechanistic, eternally changing, and with humans residing on just one of many branches on the tree of life. Adding to that list of humility, I think we can safely cross off the idea of humans being purely rational animals. We often get angry when things do not go our way and the world does not conform to our biases – political, religious, or otherwise. After every recent presidential election in the U.S., there has been an upswell in talk of people who opine that they would rather move to Canada or some other country should their candidate lose. Recently, hundreds of thousands of people have signed petitions requesting that their state be allowed to secede. I don’t know if one side of the political spectrum is more apt to throw these types of tantrums (show me the data), but before going deeper into our trenches and echo chambers, it would be a good idea to reflect on Bertrand Russell’s words. I’ve been thinking about these things for a while. 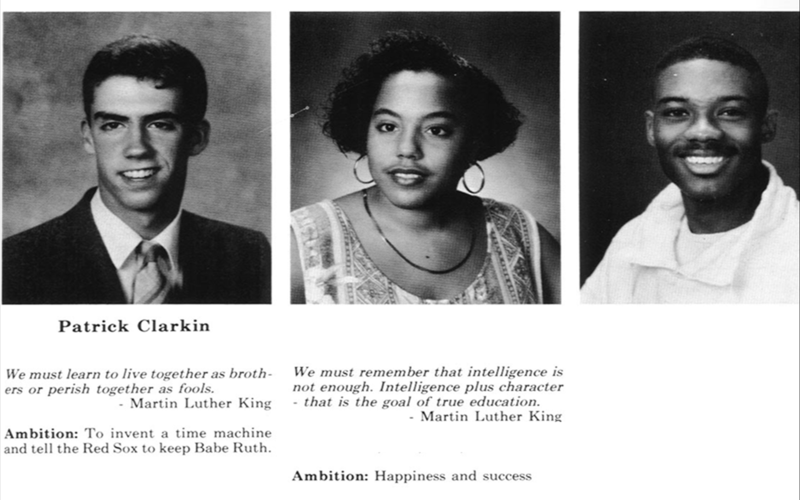 Below is my year book photo from senior year in high school, and the MLK quote on learning to live together sounds a lot like Russell’s, and is still one of my favorites. I’m still optimistic. Still biased. Still dorky (that was well before the Red Sox’ 2004 and 2007 titles). This entry was posted in anthropology, Cooperation and conflict, Reconciliation, Science and tagged Bertrand Russell, Humility, kevishere, MLK. Bookmark the permalink. Love it. Right on the money, as always. I recently discovered Russell’s liberal Decalogue, which I now have posted outside my door. I don’t think anyone has read it yet, but I think it makes a wonderful little summary of the common values of a liberal education. I don’t think we’ll ever agree on the common knowledge and the common skills, but the common values are all right there. Cedar, thanks, but I’m tempted to remove your “as always” comment. 10.Do not feel envious of the happiness of those who live in a fool’s paradise, for only a fool will think that it is happiness.